Read this post and learn everything you need to know about what digital marketing really means. The phrase “digital marketing” gets bandied about quite a bit these days. It’s one of those expressions that’s easy to use in a sentence, but a little more difficult to define. Some people say that digital marketing is any kind of marketing that uses electronic devices. Others say it’s Internet-based marketing. It looks at the history of the topic, the main types of digital marketing and more. Opinions vary, but the Wikipedia definition of what is digital marketing is probably the best. In this article, we’ll go over the history of digital marketing and explain what it is in more detail. What is Digital Marketing? When did it all begin? There are those who say that the first digital marketer was Guglielmo Marconi, because he invented the radio. Others will claim that the era of digital marketing launched in 1971 when Ray Tomlinson sent the first email (to himself, because nobody else was on email back then). Although both of those episodes represent important moments in the evolution of technology, it’s a bit of a reach to say that they launched digital marketing as we think of it today. A better starting point for the history of digital marketing is 1990. Why? Because that’s when the search engine was born. It was called Archie and it was an index for FTP sites. Archie didn’t index the web because the web hadn’t “taken off” yet. That happened a few years later. Something else happened a few years later as well. In 1993, the first clickable banner went live and another milestone in the history of digital marketing was reached. Afterwards, a company called HotWired purchased banner ads for advertising on websites. Online advertising had arrived. In 1994, a search engine called Yahoo! was born. That’s when people started searching the web for information. A couple of years later, more search engines popped up. Also, tools like HotBot, Alexa, and LookSmart made their debut. It was also around this time that web marketing professionals started talking about something called “search engine optimization.” That was a way to ensure that their websites appeared at the top of the results when people searched for specific terms. In 1998, another Internet company was born that you might have heard about: Google. It went on to become the most popular search engine in the world. Cookie technology also appeared in the 1990s. A digital cookie is a piece of code that websites leave in a user’s browser so that they can “remember” information about the user. Cookies would play an important part in the evolution of digital marketing. In the early days, though, they weren’t used much for that purpose. In 2000, the Dot-Com bubble-burst occurred and many Internet startups failed. Many of those companies are case studies in how not to start a business to this day. But the Internet wasn’t dead. Indeed, the online marketplace offered great opportunities to savvy business owners who took the time to invest in up-front market research. Something else important happened in the year 2000: Google released AdWords. That service gave marketers the opportunity to advertise their products with the assistance of one of the most popular Internet sites in the world. 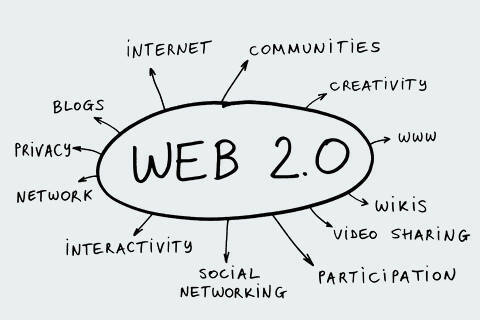 Soon, Web 2.0 came along and marked an important point the history of digital marketing. Web 2.0 sites introduced us to dynamic content, user-generated content, and what we now call social media. Perhaps the best example of an early-adopter of Web 2.0 was MySpace. Although that site soon fell out of favor, it’s considered a pioneer in the history of social media. There was another important milestone in the early 2000s. WordPress made its debut. Eventually, WordPress would make content marketing easy for countless entrepreneurs. At that point, though, not too many people thought to use it for that purpose. By 2004, Internet advertising and marketing brought in almost $3 billion. That was good news for website owners because Google had just released AdSense, a service that gave publishers the opportunity to monetize their sites. Also in 2004: Google went public and Facebook went live. At that point, though, Facebook was only for college students. In 2005, another important milestone in digital marketing was reached: YouTube launched. Digital marketers would soon discover that YouTube offered them great opportunities to promote their brand. The word “analytics” also became much more popular in 2005 when Google launched Google Analytics. That free tool, to this day, offers website owners a wealth of information about their traffic sources and visitor behavior. In 2006, Amazon’s sales reached the $10 billion mark. Also, Twitter launched and would soon become another important social media channel. The year after that, Tumblr launched. Anybody could become a blogger. But there was a far more important event that occurred in 2007. That’s when the iPhone launched. Although the late-night comics told countless jokes about how the iPhone could do anything except make a phone call, the technology was destined to catch on. Eventually, iPhone sales soared and competing products were introduced. A few years later, Fred Wilson coined a new term at a marketing conference: native advertising. He used the phrase to describe an advertising strategy in which businesses create digital content to find new customers. In 2011, another social media channel appeared on the scene: Google+. Although it never took off like Facebook or Twitter, it was destined to play an important role in the history of digital marketing. In 2014, mobile usage exceeded desktop usage for the very first time. As of this writing, that trend shows no sign of reversing. Fast forward to today, and the latest hot technology is accelerated mobile pages (AMP). That’s a way to load pages in lightning-fast time on a mobile browser. All of the technologies and practices described here worked together to give us the state of digital marketing as we know it today. The answer to what is digital marketing has changed. Digital marketing in the early days of the Internet was significantly different than it is today. It was a big deal back in the 1990s when we watched a car commercial and noticed a web address underneath the company logo. That was when business leaders first realized that “marketing” must include a digital component. Also, SEO was much easier in the 1990s. If you wanted to rank your site for a term like “blue jeans” back then all you had to do was stuff that term somewhere in your site as much as possible and include it in the title. You’d probably rank towards the top. The search engine developers quickly got wise to those tricks. That’s when they added code to prevent people from manipulating their algorithms. Advertising also changed quite a bit over the years. In the early days of AdSense, some advertisers complained that it served ads related to content rather than consumer demand. In 2004, Google allowed advertisers to opt out of the AdSense network. Life got a little better for those advertisers in 2010, though. That’s when Google started using a person’s search history to offer up more relevant ads. It wasn’t just AdSense that evolved over the years, though. AdWords evolved as well with the addition of new features like remarketing, ad extensions, and click-to-call. Online advertising in general has evolved over the years. At first, banner ads were thought to be a perfect way to reach people in a target market. Soon, though, webmasters noticed that people were just “tuning out” ads on the sidebar and at the top of a web page. In some cases, webmasters started running pop-up ads that visitors literally couldn’t miss. In others, they’d run videos (complete with audio) that interrupt the user experience. Still other webmasters opted for a less intrusive way to monetize their site with the use of native ads. While native ads look like part of the content of a site, they’re really content that’s produced by an advertiser. They’ve also grown in popularity over the last few years with companies like Taboola and Outbrain leading the way. Social media marketing appeared just as soon as social media channels appeared. However, advertising on social media took some time to evolve. It really evolved, though. Strategists who are looking to target a very specific group of people (based on interests and/or demographics) can do so by running ads on social media channels. As we’ve seen, the concept of digital marketing encompasses a variety of specific marketing strategies. It’s important to distinguish between all of them. Here’s a list of the various types of digital marketing and a brief description of how they’re used today. It’s often the case that when people want to learn more about a particular subject or buy something, they begin with an online search. That reality is gold for a lot of marketers. Why? Because if they can put their brand at the top of the search engine results pages (SERPs), they can pick up some additional business. Of course, it’s not often the case that websites appear at the beginning of the search results by accident. It’s usually the result of a very careful (and sometimes expensive) effort. That effort is called search engine optimization (SEO). It’s a way that digital strategists “convince” the search engines that their websites should rank high for one or more search terms. Like digital marketing, SEO is multi-faceted. There are numerous ways to optimize a site for the search engines. If you want to optimize your own site, you can’t do a whole lot about RankBrain. But you can start a campaign to add backlinks to your site and produce quality content. One of the best ways to add backlinks to your site is with guest-posting. Just reach out to non-competing bloggers and ask if you can post content on their site that’s of value to their readers. Somewhere in that content, include the link to your own site. Of course, you should practice good karma and return the favor by allowing the other blogger to post on your own site. Also, add a blog to your own site and produce content that’s of interest to people in your target market. That’s called content marketing and we’ll have more to say about content marketing a little later. You should also practice on-site SEO. That means you take steps to ensure that the content and structure of your site is friendly to search engines. On-site SEO is a little more technical than some of the other aspects of SEO. For example, your articles should include an HTML <title> tag that includes the keyword you’re trying to rank for. You should also include an <h1> tag in the content that matches the <title> tag. It’s also good practice to ensure that you don’t have any broken links on your site. If you’ve already got a large website and you really don’t want to through every page to check for SEO blunders, you should enlist the aid of software like Screaming Frog. That tool will give you a report of everything that’s wrong with your site. Another great way to optimize your site is with the aid of a sitemap. Basically, a sitemap is an XML representation of the way that the pages on your site link together. The reason a sitemap is so valuable is because it makes it easier for search engines to traverse your site and index your pages. Fortunately, content management systems like WordPress allow for plugins that make it a snap to add a sitemap to your site. You should also add your site to Google Search Console. Once you’ve done that, Google will inform you about what you can do to improve your website’s search presence. Since Google isn’t the only search engine in town, you should also visit Bing Webmaster Tools and register your site there as well. Both Google Search Console and Bing Webmaster Tools offer helpful analytics about how well your site is performing in the search engines. You can use that information as feedback to help you strengthen your SEO efforts. Search engine marketing (SEM) is different than SEO. With SEO, you’re earning traffic through unpaid listings in the SERPs. With SEM, you’re buying traffic with paid listings in the SERPs. The unpaid listings are often referred to as “organic” results. That’s because they appeared there naturally. Paid listings, on the other hand, appear in the SERPs because you paid money to place them there. The good news about paid listings is that they’re at the top of the search results. So if you’re looking for a short-cut to get your site to the very top of the SERPs, then you should consider SEM. How much does SEM cost? That depends. Usually, you’ll run an SEM campaign by requesting that a search engine lists your site when people search for one or more keywords. How much your campaign will cost depends on the competitive nature of those keywords. For example, right now the suggested bid for “blue jeans” is $4.82. That means if you want to display your site in the SERPs when people search for “blue jeans,” it will cost you $4.82 every time one of those people clicks on your link. The term “trs-80,” on the other hand, will only cost you five cents per click. The downside to SEM isn’t just the cost, though. SEM listings usually appear in designated spaces in the search results, so people often tune them out in favor of the organic (or more “authentic”) results. Still, many brands to this day are using SEM to promote their products and services. They clearly view it as a value. As we’ve seen, Google says that content is one of the top three ranking factors. That’s why digital marketers are so gung-ho about content marketing. In a nutshell, content marketing is about producing quality content on a blog that’s designed for people in your target market. Then, when those people search for a term related to your industry, they’ll stumble across your awesome article and learn more about your brand. Unsurprisingly, some of the people who are best at using content marketing to promote their brand are digital marketers themselves. Just use Google to search for the phrase “content marketing” right now. The results list on the first page will show you a bunch of websites that are all about digital marketing. Our company Ignite Visibility does a lot of content marketing. That is why we blog often here and on sites like Entrepreneur. Many marketers begin their content marketing efforts with keyword research. The idea behind keyword research is to find keywords that are 1) relevant to people in a target market and 2) not difficult to rank for. If you’re interested in keyword research, it’s a good idea to enlist the aid of a tool like SEMRush. You’ll have to pay a monthly fee, but you’ll get some great insight about keywords in your niche that are ripe for the picking. SEMRush will also let you know which keywords are bringing people to your competitors’ sites. More importantly, you’ll see which backlinks your competitors are using to help rank for those keywords. Once you’ve established which keywords you want to rank for, it’s time to develop some content around those keywords. It’s usually best to produce one article for each unique keyword. That way, you’ll have plenty of content on your blog and many more opportunities to rank your site. As a rule of thumb, you should include the keyword in your article title and first paragraph. Also, you should sprinkle it throughout the content. Be careful, though. You don’t want to use the keyword too much in your content or you’ll send a signal to the search engines that you’re not playing by the rules. Also, it’s a good idea to produce longform content. That’s content at least 1,500 words in length. Longform content has numerous SEO benefits. Just be sure to break up lengthy articles with subheadings and images so that it’s easier to read. Another great way to promote your brand is with social media marketing (SMM). One of the best advantages of social media marketing is that it’s free. Sure, you can run ads on various social media channels, but we’ll cover that in the next section. Your goal when it comes to SMM can be summed up in one word: engagement. When people comment on your post, share it, or “like” it, you’re getting a response from people in your target market. That response helps you build trust with those folks. More than that, though, engagement helps you promote your business. That’s because some of the social media sites (like Facebook) will use engagement to determine the “popularity” of a post. Very popular posts, as you might have noticed, tend to get pushed to the top of people’s feeds and get even more exposure. That’s why you should post content on social media that helps your followers. Do that instead of just posting sales pitches and you’ll go a long way in earning people’s respect. Of course, it’s also important to pick the right social media channels for your brand. For example, if you’re running a company that relies heavily on visuals for promotion (a fashion company, as an example), then you should be active on image-centric social media channels like Instagram and Pinterest. On the other hand, if you’re running a B2B company, then LinkedIn is your sweet spot. We’ve already discussed one form of pay-per-click advertising: SEM. But that’s not the only option out there. In fact you can run ads through a variety of ad networks and even on social media channels. Although online ads offer a great way to drive traffic to your site, be sure to check with your accountant to make sure the ROI is worth it. Otherwise, you could go in the hole while drawing an audience. Social media sites offer some of the best bang for your buck when it comes to advertising because you can run a campaign to an audience that’s likely to be part of your target market. Just select who sees your ad based on demographics and interests and let it run. Some ad networks also let you run native ads. It’s best to look at sites that run native ads so you can get an idea of what types of ads are most effective. Of course, you can also run banner ads on websites as well. Just be sure to limit your advertising only to those sites most frequently visited by people in your market. Did you know that you can make money by selling products without even carrying an inventory? You can, with affiliate marketing. Some companies let you advertise their products on your website. If one of your visitors buys a product, you get a commission. It’s that simple. Of course, you have to get approved to become an affiliate marketer. Some brands don’t want to be affiliated with certain types of websites (for obvious reasons). Approval is usually pretty easy, though. You fill out an online application, submit your tax information, and wait for the response. Once you’re approved, you can start listing that company’s products on your website and reap the rewards of your sales. One of the most popular affiliate programs is Amazon Associates. Yes, you can make money selling pretty much anything that Amazon sells. In other words: you can make money selling anything. If you don’t want to be tied down to just one company, though, you can head over to Commission Junction and find countless online e-tailers participating in affiliate programs. Select a few that are relevant to your niche and advertise their products on your website. Many professional marketers consider email marketing to be one of the most effective aspects of online marketing. Why? Because it’s more of a “push” marketing strategy. You’re communicating with individuals directly on a platform they check almost every day: their email inbox. The most important point to remember about email marketing, though, is that you should always secure permission from people before adding them to your email distribution list. Otherwise, you’re just a spammer and will likely find that you do your brand more harm than good. So how do you get permission to send people an email on a regular basis? Most marketers accomplish that with the use of a carrot: they offer something free in exchange for the email address. For example, if you’re marketing a line of beauty products, you could offer an e-book that’s packed with makeup tips and tricks. Tell people that you’ll happily send the e-book URL to their inbox in exchange for their email address. Once they supply the email address, you can add them to your distribution list. Just be sure to let them know at some point during the transaction that they’ll be added to the list and receive periodic emails. Use email distributions lists to promote your business as you see fit. Provide links to great content that you’ve created on your site, announce special offers, and tell people about new products in your product line. Although there’s a stark difference between offline and online marketing, the two often work together. One way that they work together is in showrooming. That’s when people visit a store, find a product they like (for example, a sofa), then go home and go online and order the product at a discount. Some people practice the opposite of showrooming: webrooming. That’s when consumers window-shop online for a product, find the one that they want, and then go visit a store that sells the product so they can touch it in real life and possibly buy it. Savvy marketers know that people are showrooming and webrooming. That’s why they pull out all the stops to make sure that their products are marketed both online and offline. Some people also integrate SMM with their offline marketing. For example, if a company is hosting an event, the organizers would create a hashtag for it. Then, they’d promote that hashtag all over the place so that when people tweet about what’s going on at the event, they’ll use the hashtag. If the event is crowded and lots of people are simultaneously tweeting about it, the hashtag is likely to make it into Twitter’s trending topics. When that happens, even more people learn about the event. Marketers also integrate both worlds of marketing with the aid of custom URLs. They do that for two reasons: 1) to make the URLs memorable and 2) to track the effectiveness of the campaign. Think about this: if you’re driving somewhere with the radio on and you hear someone advertise a URL like “http://oxfordwidgetsonline.com/registernow/form.php”, are you going to remember that? Probably not. On the other hand, if you hear a URL like “http://register.now” will you remember that? Probably. That’s how a custom URL can work in offline marketing. It offers consumers an easy-to-remember way to reach a website. Of course, the best way to integrate online and offline marketing is with consistent branding. The overall ambience of your business culture and your approach towards your customers should be consistent in your online and offline efforts. Obviously, you should use the same logo everywhere. Beyond that, though, the “tone” of your website design should match the way that you reach out to people in TV and radio ads. Digital marketing, for most brands, is an absolute necessity in this day and age. Even local mom-and-pop shops that try to avoid any kind of online marketing are in danger of going out of business. The challenge for most companies is that digital marketing is multi-threaded. That means it’s important to hire a team of consisting of individuals who are experts in each of the various digital marketing components (email marketing, SEO, PPC, etc.). This overview was only meant to give you the “big picture” about digital marketing. It’s not by any means an exhaustive overview of everything related to marketing online. Now that you know the basics, it’s time to improve your digital reach. Go find some partners who can help you boost your brand online.